A potentially historic heavy snowfall event is anticipated to take place Christmas night through Tuesday across the Tug Hill Plateau. The really heavy snow will stay out of the Mohawk Valley during this time period, but things will change by Tuesday night thanks to a wind shift. As you can imagine, the lake effect parameters are off the charts. We have ample moisture from the departing storm, plenty of cold air in place, and a very consistent wind from the west. Combine that with orographic lifting over Western Tug Hill, and it's the ideal scenario for heavy lake effect snow. While all this is taking place we want to point out that Lake Erie will also be active, allowing snow squalls to occasionally hit the Southern Valleys. This is why we hedged our map to include a trace to 3" for this region, rather than keep all the accumulation north of the NYS Thruway. The winds do shift into the northwest on Tuesday night, allowing the band to shift south. 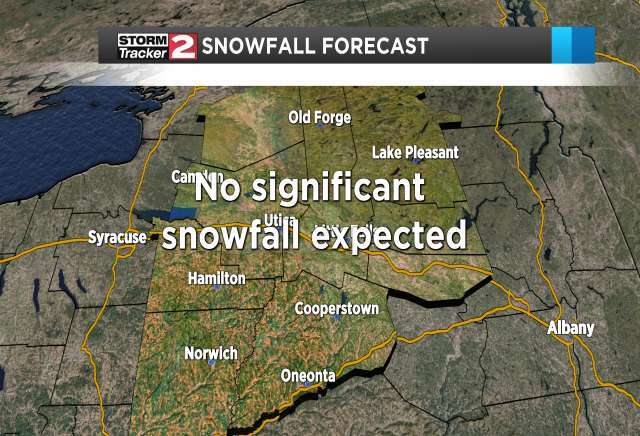 At this point, areas near and north of the Mohawk Valley could see a burst of snow Tuesday night. We'll keep you posted on that end of the deal, as the wind direction is quite challenging to hit even within 36 hours.